filigno, cubus pure and cubus Home Entertainment enable an exceptional film and sound experience in your living room. The basis for this is a body of pure solid wood, which is optimally designed to support your sound system. 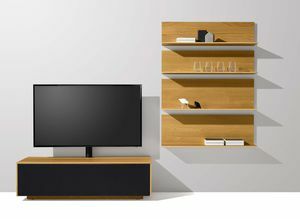 This specially-developed living room range is the perfect solution for all Home Entertainment equipment. An intelligent ventilation system prevents your devices from overheating. The easy-access cable management system and generous space guarantee maximum convenience for the user, as does the innovative Qi charging technology, integrated in the cable flap for the wireless charging of smart-phones and tablets. A subwoofer element ensures that the subwoofer is seen little - but heard loud and clear. The device can stand directly on the floor, mounted in the body. In this way, disruptive vibrations are avoided. The subwoofer cube can be part of a Home Entertainment ensemble, or can alternatively be a free-standing unit in the room. Your wish is the programme. 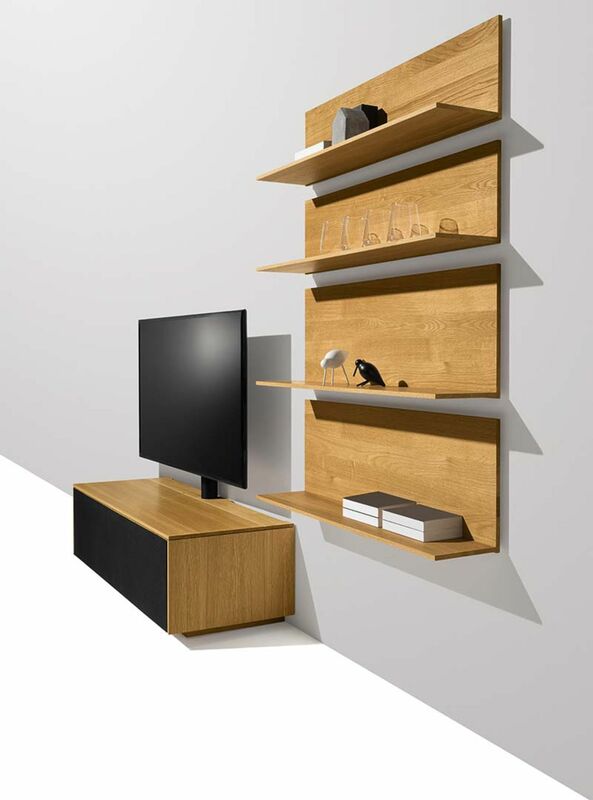 Whether as part of a wall unit, as a stand-alone or as a room divider – you can count on our flexible furniture to fit your individual needs. Many different types of wood, handles, an optional speaker flap with acoustic fabric in various colours, and a range of glass colours including your personal favourite colour* let you design this unit to your own specific wishes. Old, Venetian and full of history: Venetian oak. The oak wood for this special surface already has a long story behind it. Old Venetian oak stakes are buried behind the name. The traces of the tides and the shells are characteristic for this wood and highlight its naturalness. The unique surface tells the story of the wood’s colourful history and brings the legend of the Italian lagoon city to your home. What does our Home Entertainment furniture have in common with guitars, violins or pianos? A precise hand-made body of solid wood forms the basis for optimum sound performance. It also provides plenty of space for your Home Entertainment systems, convenient wiring, and enough space for the ideal ventilation of your devices.